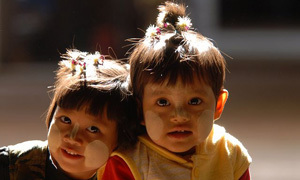 The culture of Myanmar is heavily influenced by Buddhism and the Mon people. Daily life of the Bagan people revolves around the Buddhist faith. Aside from strict observance of Buddhist Sabbath days, people uphold age-old traditions such as respect for monks and elders, and scheduling important events on lucky days according to the Buddhist calendar. Boys who are old enough to pronounce the Pali phrases articulately are usually made to undergo a noviation ceremony, whereby they enter the Buddhist monastery in order to be initiated into the rites of monkhood. Their heads are shorn, and they are made to wear saffron robes and lead lives of self-denial and alms-seeking for about one week. People believe that supporting monks bring them a step closer towards salvation. Pagodas are entered in bare feet. Bagan people are always modestly clothed; men and women usually wear the longyi, a sarong-like skirt. Most are made from light-weight cotton, while silk is used for special occasions. Both men and mostly women apply white powder from the “thanaka” tree branches on their faces and exposed skin not only for a cosmetic touch, but also for protection against the sun’s powerful rays. Likewise, because of the hot dry climate on the Bagan plains, houses are mostly made of wood, bamboo and thatch. 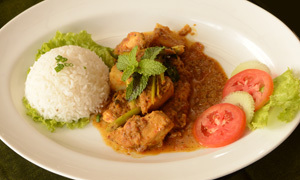 Myanmar cuisine has been influenced by Indian, Chinese and Thai, as well as domestic ethnic cuisines. It can be characterized by having a mildly spicy taste. The most famous Myanmar dish is “Mohinga”, rice noodles in a rich fish soup. The Myanmar people traditionally eat with their fingers, although the usage of Western utensils and chopsticks has become more widespread, specially in cities and towns. White rice is the staple food of the Myanmar diet, but noodles and Indian breads such as naan are also eaten.